Flax was the life-blood of Foxton for more than 100 years. Early ropemakers employed Mãori women to scrape flax leaves. In 1869 Charles Pownall invented a machine to strip the flax which was then washed and dried on fences. Much of it was baled and sold overseas. Many flaxmillers went bankrupt when jute and other fibres flooded the market. The New Zealand Woolpack and Textile Company opened a factory in 1933. During World War 2, enough woolpacks were made to supply New Zealand farmers but rising costs and a flax disease caused the factory to close in 1973. 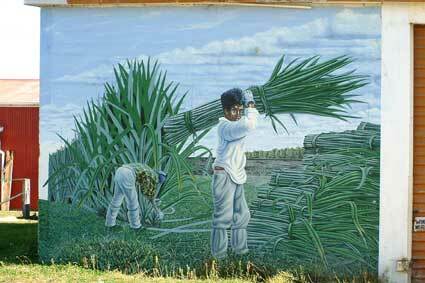 This mural depicts flaxcutter Bill Stretch with a bundle of flax. This mural has been lost due to the new Mitre 10 buiding on the old site.